If you are somewhere in your forties there’s a good chance that you are experiencing a major life-shift. You might be engaging this shift in a spirit of fully conscious participation, but more likely you have noticed it creeping outside your windows at night and scratching at your screen door. Things that once motivated you to get up early and stay up late now barely hold your interest. The compelling sense of heroic purpose that had ignited your passion to change the world is starting to feel contrived and maybe even a little sickening. You keep waking up from a disturbing dream, only to slowly realize that the dream is your life. Or maybe you realize it all at once. Your career slides over the edge. Your marriage starts to pull apart at the seams. Your doctor finds a mass, or you unexpectedly lose a loved one. When it happens that fast, this life-shift I’m talking about can cause your entire world and sense of self to come unhinged. Something has changed, and there’s no going back to the way things were. If a way forward is even possible, you start to feel that it might not be worth it. It just might be over. There’s nothing left. Your friends look concerned. You must be depressed, so they try to pick you up. Get some sleep. Take some pills. Have another drink. Don’t be so melancholy – you’re bringing the rest of us down! Maybe you’re thinking too much. Lighten up. But if your friends are in a similar existential place in life, chances are really good that you’re going to sink for sure. What’s going on? Of course it’s hard to say with any categorical certainty, but the things happening inside and around you could be very natural – even to some extent inevitable. Here’s one way of looking at it. In the first half of life you are busy preparing for and then enthusiastically carrying out the imperatives of your culture. Your upbringing and years of education fling you out across the surface of life in pursuit of happiness and success. If you have sufficient ambition, you are expected to get far. Along the way you are rewarded for your achievements and given recognition in the form of gold stars and lollipops, ribbons and trophies, diplomas and promotions. The better you are at getting ahead and keeping up with your competition, the stronger and more meaningful these social reinforcements become. You are expected to get a job, find a partner and get married, raise a family and invest in the commonwealth. So you put on the suit, grab your coffee, and head out the door. On it goes: day after day, week after week, month after month, and year after year. For the first forty-five years or so you are a Skimmer, arcing through the world like a skipping stone on a pond. The fantasy of worldly success, exaggerated even more by the nagging fear of failure, throws you across a long series of experiences, tracing a line that by default becomes the plot of your life story. Then you blink and a couple of decades are gone. Your kids are stepping into their own lives and not calling you as often. The work on your desk starts to feel tedious and boring. You look in the mirror, and to your shock someone has pulled the flabby skin of an older person down over your head. The bars on the merry-go-round are beginning to slip your grasp. Hang on! you’re told. Young ambitious career chasers (and comparatively better Skimmers) are getting interviews for your job right now. Try to keep up! Now you find yourself with a few close friends, drinking wine and struggling to make sense of this heavy exhaustion you feel. Something is shifting, but what? In a way, the world has let you down. The seductive fantasy of identity, purpose, and success is flickering on the screen – a screen you had regarded a clear window on reality for so many years. It’s as if the axis of your life orientation is flipping 90° from horizontal to vertical, dropping you like a stone. Consider this your invitation to life in its fullness. You are at the threshold of something that no one so far has been able to fully comprehend or explain. Those who risk faith in this deeper mystery have found the grace to slow down, let go, and sink into being. They are Sinkers, which according to the value system of Skimmers makes them drop-outs. Sinkers are on the quest to live more intentionally. They seek inner fulfillment rather than outer accomplishments and social validation – another value that can sound to Skimmers like a gospel of selfish gratification, when it’s really the exact opposite of that. Life that is “filled full” has nothing missing; it is complete and whole, just as it is in this moment. There’s no need to make it count, make it meaningful, or make it yours. 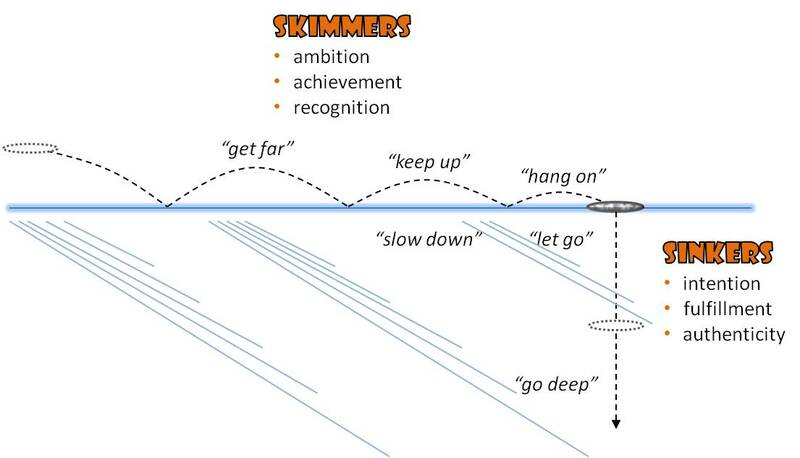 So if life is starting to feel uncomfortable, if the glamor and shiny incentives are just not exciting anymore, and you’re not sure you’ve got any more “skips” in you, take heart. Nod your head and thank your friends for their sincere concern and earnest words of encouragement. Sure, you still have undiscovered talents. You’ve made a difference, and there’s more for you to accomplish out there in the world. Don’t be afraid. What’s happening is what must happen. It is the way of things. You needed to wake up sometime. So now stay present, release your expectations, and allow yourself to gently sink into being. Have faith and relax … all the way down. The average person is obsessed with identity. We come through childhood with all the instructions and labels that have been put on us by our tribe, and we can spend our entire adulthood trying to justify and live up to them, reverse them and prove them wrong, or we simply allow these programs to push us along without much self-awareness. It could also be said that the average person is tormented by this obsession, since there really is no way of breaking free. Conventional culture and religion have accommodated this ego fixation. We invest more and more in protecting the security of who we are, and the whole “meaning of life” has become for many the hopeful prospect of securing immortality in heaven when they die. Theism – the belief that (an) identity stands apart from and above reality as its maker and manager – both reflects and reinforces this preference of glorifying ego as our highest concern. As a product of “social engineering,” the ego of personal identity is shaped and directed in ways that promote the collective identity of our tribe. This is not necessarily conducted with intention, but rather insinuates itself into the more or less automatic routines of parenting, education, politics and civil law. We are told to be “good” children, “good” Americans, “good” Christians – which means compliant with the tribal structures of family, nation, and religion. To be out of compliance (naughty, criminal, heretical) is to risk the forfeiture of our identity, and by extension the culturally supported meaning of life. To either side of this narrow ridge of personal identity (as illustrated above) are two distinct paradigms for answering a more philosophically interesting question: not who you are as a person, but what you are as a human being. These two paradigms – which we can call “science” and “spirituality” – are not necessarily competing frameworks of research and explanation, despite the fact that they are popularly regarded as such. The real tension, however, is between the cult of identity and the paradigms on either side. According to the scientific paradigm, ego (personal identity) is not an object of study in and of itself. Because the ego cannot be dislodged from the multiple lines of social influence that define it, science treats it as a byproduct (technically an epiphenomenon) of something else rather than a separate existence in its own right. 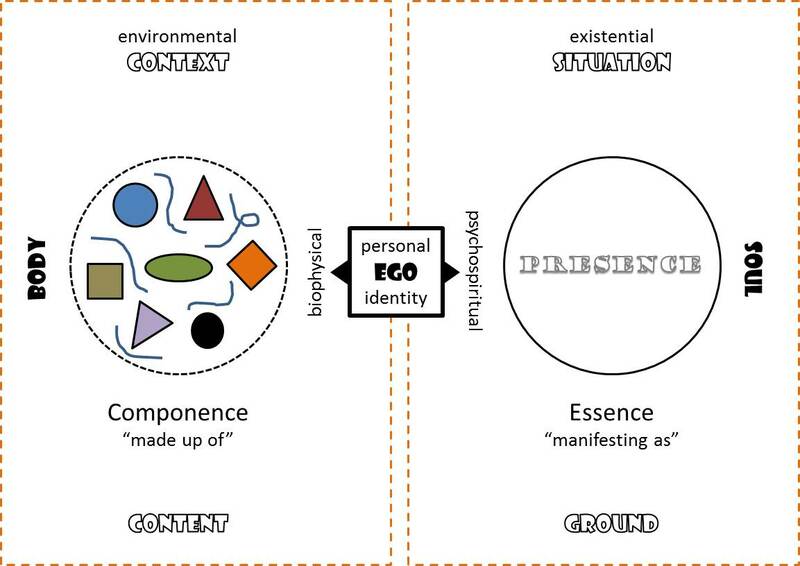 Social science has made great progress in seeing the ego as a nexus of cultural meaning and social control, interpreting personal identity as a function of its environmental (tribal) context. In addition to expanding out into the cultural context for an understanding of what a human being is, science is also investigating the biophysical foundations of personality. Ego can be analyzed into the conflict between the instructions of society and the animal impulses of the body, as Freud did. It might also be broken down into genetic and temperamental factors determining an individual’s mental order and orientation. Drug therapy is a treatment protocol based on this notion of identity (personality, ego, and mental health) as a secondary effect of the physical conditions underlying it. For the fun of it, I’m going to make up a word and say that science (all science) is the empirical quest for the “componence” of things. Everything that exists has a “componential” nature, which is simply to say that it is a component (part) in a larger order and is itself made up of smaller and deeper components that might be further analyzed. Because there are no egos that exist apart from bodies, science proceeds on its commitment to explain personal identity in terms of the body – its deeper componence as well as its participation as a component in the social system. As you would expect, devotees in the cult of identity criticize science as “impersonal” (which it can be) and on an offensive campaign to undermine religion (which it isn’t). The problem, of course, is that because popular religion has taken on the immortality project of the ego as its driving mission, the scientific challenge to the belief in a metaphysical and everlasting center of identity is rightly regarded as a threat. Just like science, spirituality seeks to understand and celebrate what it is to be human. Although there are teachers and esoteric schools that capitalize on our disillusionment with popular religion, they typically take up the immortality project and merely cast it under another set of metaphysical claims. This might amount to a return to paleolithic rituals, ancient secrets, and exotic doctrines, but it remains organized around the disguised status of the believer as divine and destined for higher planes of bliss. My use of the term spirituality is not in reference to special revelation or the supernatural. Like science, spirituality is a quest for what is really real. If it begins this quest from the position of identity, spirituality quickly leaves behind the obsessions and ambitions that captivate the ego. Instead of proceeding in a biophysical direction, however, it moves along a psychospiritual (and transpersonal) path of investigation, exploring the threshold between individual self-consciousness and the provident reality to which it belongs. Recent efforts in psychotherapy have managed to bring the topic of spirituality and religion back into the clinical conversation. Religious values and beliefs are recognized once again as important to the mental health of some clients. 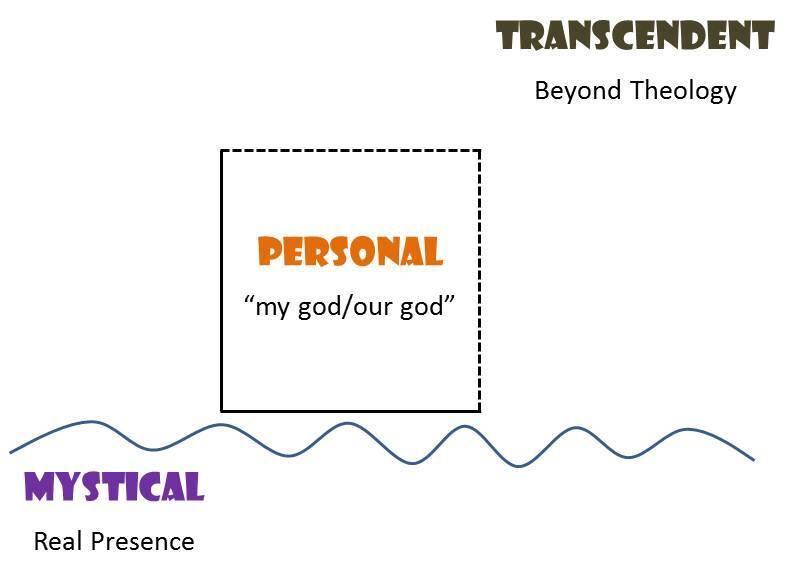 The emerging therapeutic models, though, are mostly classical theories of the mid-twentieth century with an “annex” of spiritually-oriented strategies attached – just in case. Again, spirituality (and science) asks not “who” you are, but “what” you are. What is a human being? A characteristically “spiritual” phrasing of the question might be: What is the nature of being in its manifestation as a human. This is the question of essence (from the Greek esse, being). Being doesn’t merely name the fact of existence, but refers to the act of existing (from the Greek existere, to stand out). The existentialist theologian Paul Tillich translated it as “the power to be” or being-itself. As a human being you stand out, just as you are. Instead of digging into your componential nature as science will do, spirituality takes you as “just this” – not something else, and nothing less than the present mystery of reality. This power is nowhere other than in its manifestations. But it is more than any single manifestation simply because it exists or “stands out” over there as well. Reality is present here in human form as you, and it is present over there in another form. I’m putting an accent on this matter of location (here and there) because existence is always situated somewhere. The ego may seek to escape here-and-now for something better elsewhere or later on, whereas the soul seeks communion with the present mystery of reality. In contrast to ego religion and its otherworldly aspirations, spirituality engages the present situation with full attention and total freedom. It doesn’t crave to be anywhere else or hide from the accidents and conditions of mortality. Trouble, affliction, and bereavement will come, but your faith in the provident support of reality in this moment enables you to be present in the situation with generosity, compassion, and gratitude. It’s not that you do nothing, but that you bring the full force of your soul (Ghandi’s satyagraha) to the challenge at hand. As we would expect, the cult of identity is suspicious of spirituality as well. Nothing good can come from setting aside your petty agendas, nervous attachments, and ulterior motives – can it? Life will lose its meaning if you take a deep breath and open up to the real presence of mystery – right? If the human adventure isn’t really about getting somewhere else later on, then all we’re left with is … this!